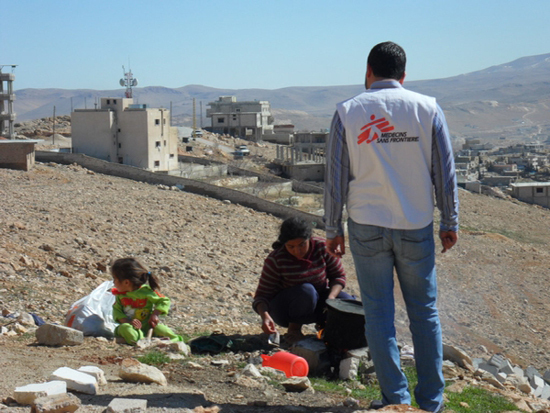 MSF is expanding its activities in Lebanon for Syrian people seeking shelter and medical care. An MSF staff member attends to a Syrian family that fled across the border to Aarsal. Since the conflict began in Syria, tens of thousands of Syrians have taken refuge in neighboring countries. As more and more people have crossed over into Lebanon seeking shelter and medical care, Doctors Without Borders/Médecins Sans Frontières (MSF) has extended its activities in Lebanon to the regions of Wadi Khaled, Tripoli, and the Bekaa valley. Laurent Ligozat, MSF’s deputy operational director, is just back from the region. “More than 20,700 Syrians who have fled their country are now officially registered in Lebanon, out of 27,000 reported by the UN Refugee Agency. Most of them are living in the north and the Bekaa valley. Some are staying with relatives or with the local community; others are living in public buildings or abandoned houses. Most have few possessions, and life is a daily struggle. Health services and local NGOs [nongovernmental organizations] are also coming under strain. The turmoil in Syria is not improving. For escapees, the shelling, the journey to safety, and the resettlement in Lebanon have all been deeply traumatic experiences—for adults as much as for children. They find themselves reliving disturbing past events, such as the loss of their relatives and of their houses. Many are overwhelmed with feelings of fear, insecurity, and uncertainty about the future—and this comes on top of the economic difficulties they are facing. We identified mental health care as a particular gap in the medical services on offer. In November 2011 we started providing consultations and running support groups, psycho-education sessions, and family therapy in the northern region of Wadi Khaled. As more and more Syrian families started settling in the northern city of Tripoli, we expanded to Dar al Zahraa hospital and Tripoli governmental hospital, providing psychological and psychiatric consultations, as well as primary health care services—including childhood immunizations and the treatment of chronic and acute diseases—to both Syrians and local Lebanese. We are also working in the Bekaa valley, which is the main crossing point today for those escaping the violence in Syria. MSF medical teams have carried out over 4,600 primary health care consultations and over 900 individual psychological and psychiatric consultations, all of them free of charge. We have also covered the hospitalization costs for 86 medical emergency cases, including deliveries, dialysis treatments, and lifesaving operations. Local NGOs have worked closely with us throughout, and played a crucial role in helping us reach out to groups of vulnerable refugees. They have also loaned us premises so that we can get our medical services up and running fast. The local communities—both in Wadi Khaled and the Bekaa valley—have done a huge amount to lighten the burden suffered by Syrian refugees. There is a great sense of solidarity, and many have opened their homes to the refugees, sharing living space and food. But there are still many new arrivals in need of a place to stay. In March we helped refurbish five public buildings to house Syrian families in the border town of Aarsal. Shelter is already a serious issue, especially in Aarsal and Tripoli. This is because the refugees keep on coming, and the host community just doesn’t have the space to take in any more. I visited houses where two or three families were already sharing just one or two rooms. The Syrian refugees often arrive with almost nothing, and, without a way of making a living, their economic situation can deteriorate fast. They are in need of basics like food, baby milk and [diapers], hygiene items, cooking equipment, mattresses, and blankets. Between January and May, we provided about 2,150 people in the mountainous Aarsal region with relief items, including fuel and wood for heating. We are seeing a lot of musculoskeletal complaints, acute respiratory tract infections, and skin diseases amongst the refugees. Some may be linked with the poor conditions in which so many are living. During the winter, there were families in Aarsal staying in half-constructed buildings with nowhere to shelter from the snow and freezing cold. Others have no access to running water. Refugees with chronic diseases are also at risk, as they may have fled Syria without their regular medication, and [are] unable to afford to buy more. We have treated some severe cases in Tripoli: one patient had to have his toe amputated due to a complication of his diabetes, while a hypertensive patient came in with hemiplegia, meaning that one side of his body was paralyzed. Children are particularly vulnerable. Many children have experienced the disappearance of family members and the deaths of relatives and friends. They may have witnessed killings and beatings, have had to leave their homes under dangerous conditions, and are often anxious about relatives who stayed behind. In terms of mental health, we have seen cases of mutism, but the most common symptoms are bedwetting, regressive or aggressive behavior, and constant fear related to traumatic events. Adults, of course, share the same fears, and our mental health teams have found people with acute symptoms including suicidal thoughts, post-traumatic reactions, physical complaints related to psychological distress, and acute psychosis. Depression and anxiety are the most common diagnoses. The Syrian crisis is having a growing impact in Lebanon, especially in the border regions and Tripoli. Since mid-April, we have expanded our mental health care services to Tripoli governmental hospital, located in one the most conflict-ridden areas, and an MSF emergency doctor is also helping in the hospital’s emergency department. MSF plans to reinforce its capacity to provide emergency medical care for civilians directly or indirectly affected by the violence by working in a hospital and two health centers.